On a recent and showery Saturday, we ventured down the peninsula to Portsmouth. Our primary purpose was to visit the monthly Antiques to Flea Market, a free event held each month in the Middle Street parking garage. 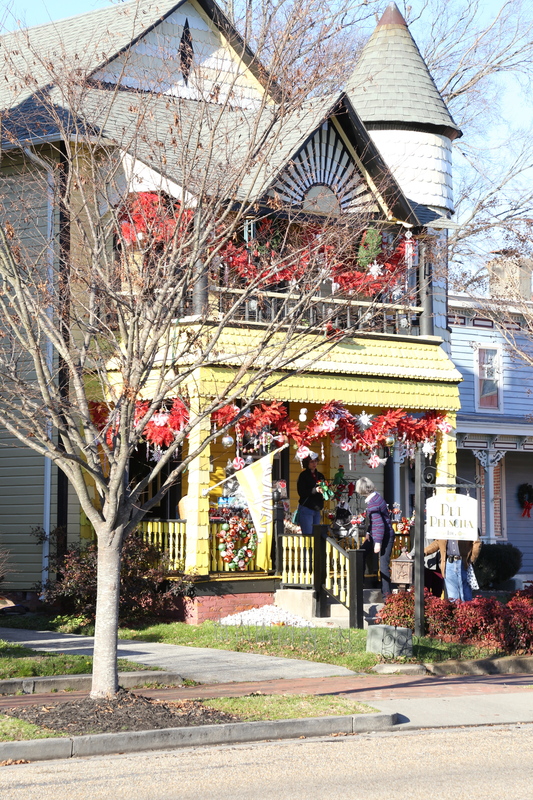 We also planned on walking around the Olde Towne area and to find a place for lunch. 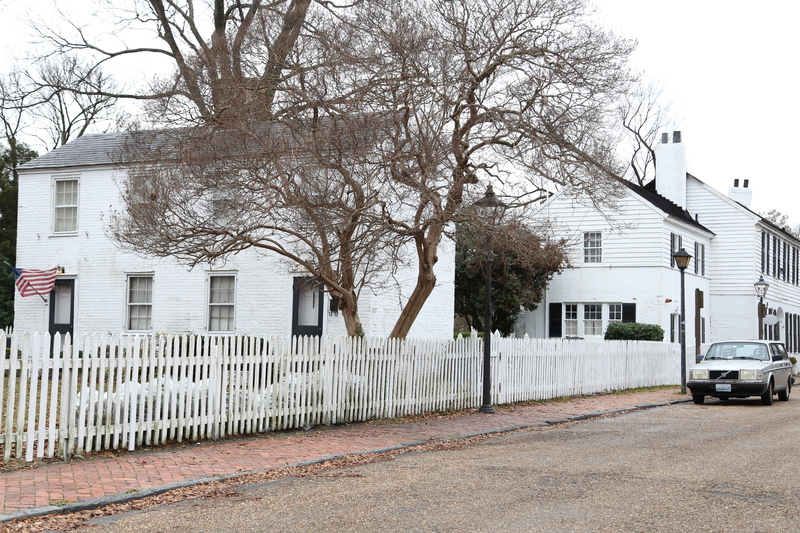 Like many of the cities in the area, there are many historical sites, some predating the Revolutionary war while others are related to the Civil war. To learn more about these sites, stop by the Visitor’s Center and pick up a map for the self guided walking tour. A good place to start is on the water front by taking a stroll along the sea wall. 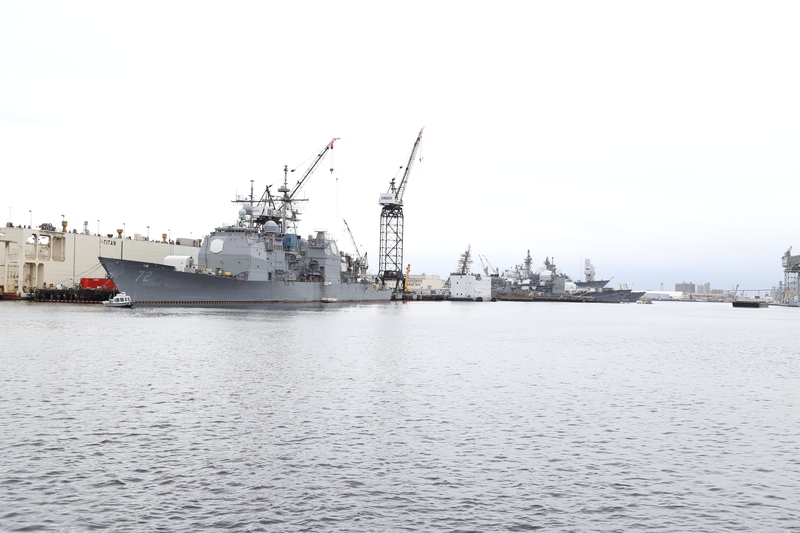 The view of the Norfolk Shipyard and downtown Norfolk are just a part of what you will see there. 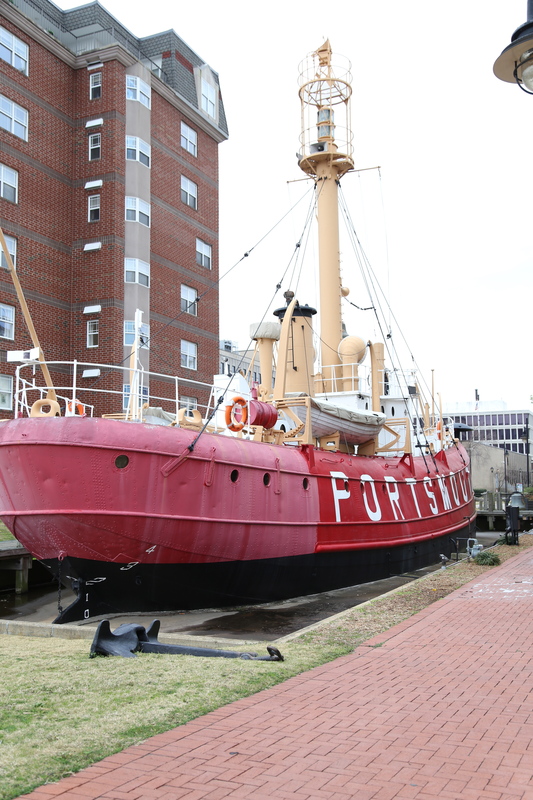 In warmer months, the Lightship Portsmouth museum is open for tours. 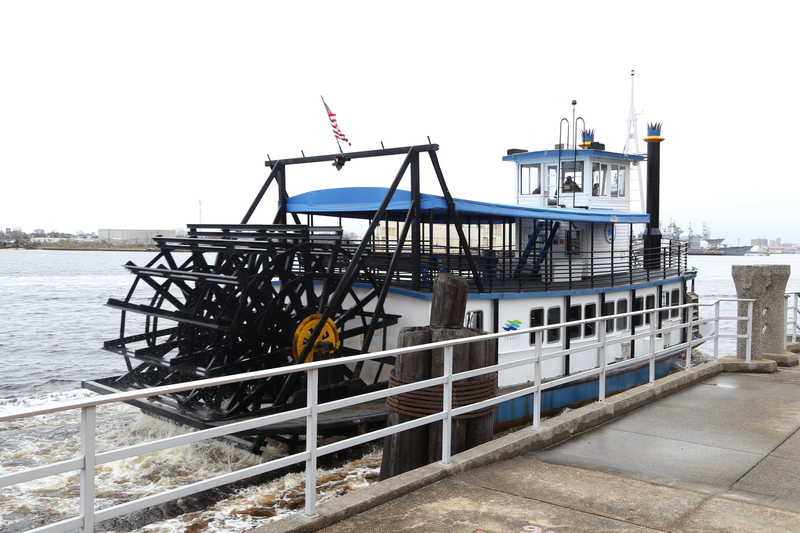 However, there are several other museums in the area and the ferry that travels across the Elizabeth River to the downtown Norfolk area to keep you busy. If you are looking to grab lunch, venture over to High Street. Both sides of the street in this shopping district are lined with just about every type of restaurant imaginable. We took the recommendations of a nice family walking past us and ventured into the Bier Garden for some authentic Bavarian food in the hopes of taking the chill off. If the weather had been a little warmer and drier, we would have spent more time exploring the waterfront. We thought about taking a ride on the ferry but it requires exact change ($1.75/$3.50 per person/round trip) which we did not have with us and because it was drizzly and cold, it did not seem like the best idea. At first glance, this ship does not look that big until you notice the tug boat out front. It quickly provides a scale to judge the size and also makes the river seem so much larger as well. Portsmouth is an old port and the Atlantic Intracoastal Waterway begins with mile marker “0” in the water between Portsmouth and Norfolk. A chance to ride the paddle boat ferry will be just one of the reasons we go back to Portsmouth. The schedule is available in the Visitor’s Center, just remember to bring plenty of change and small bills to get on. Blame it on this guy! He followed us as we walked the length of the property and more than once, he jumped up and barked at us. We stopped and petted him a few times, his tag told us his name is Crosby and he was very friendly. 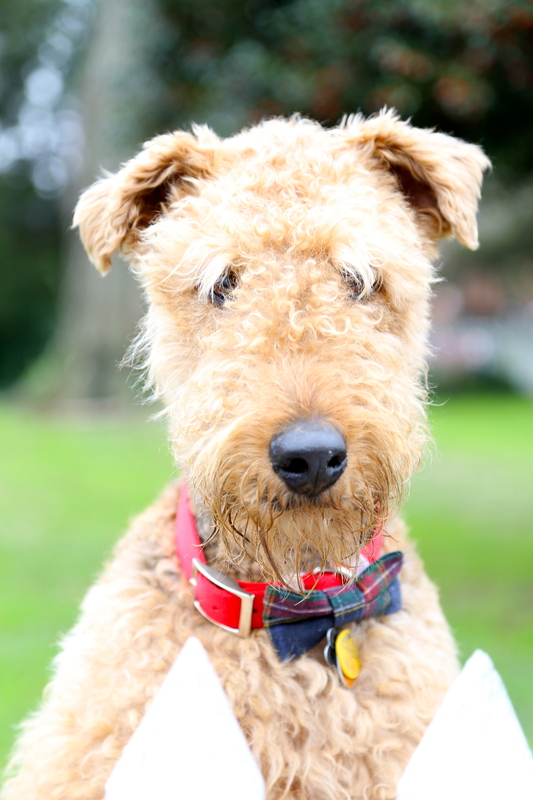 Don’t you just love the bow tie? See you next time Crosby! One of the exciting things that come with moving to a new city is what you discover in your own backyard. When we chose our new home, we focused on location because it was important to us that Darry not have a long commute to work. His schedule is erratic at times and 14 hour days are not unusual, a long commute was not an option. We were lucky and found this home quickly and now he has a 3.9 mile commute to work each day. The other added perk to our location, exactly that; the location. 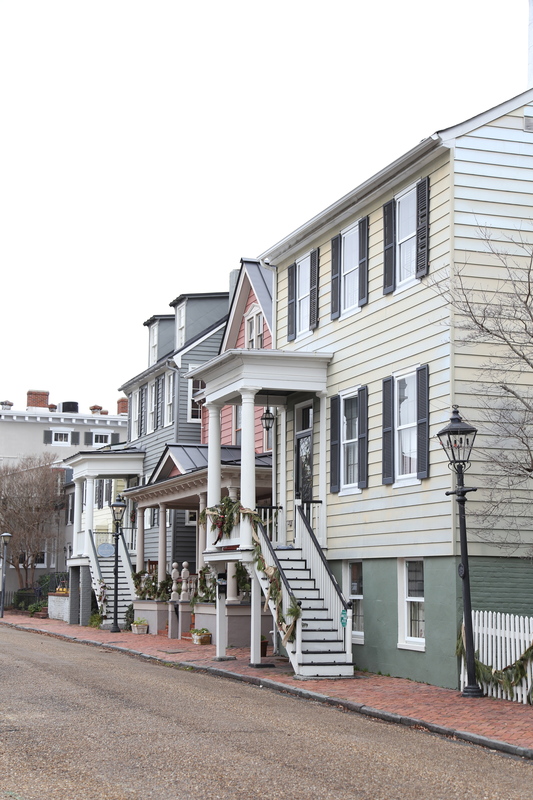 We are within the Historic Triangle which means we are a stones throw from the Historic Jamestown settlement, Colonial Williamsburg and Yorktown. However, there is so much more here besides the very first Colonial Settlement and Revolutionary War battlefields. 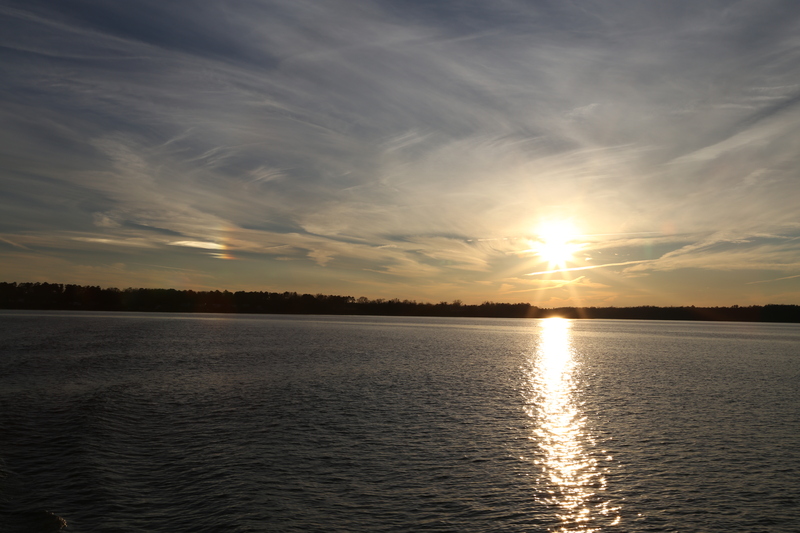 We are located near the Atlantic Ocean and the Chesapeake Bay but also between the York River and the James River. And where there are rivers, bays and oceans, there are a multitude of cities, large and small and the Middle Peninsula of Virginia is no exception. As we settle in here, we venture further out and recently spent an afternoon in Smithfield. If that name sounds familiar, it should because just about everyone who eats ham has heard of Smithfield hams. However, when we headed that way to spend the day in the quaint downtown area, we didn’t have ham on our minds. 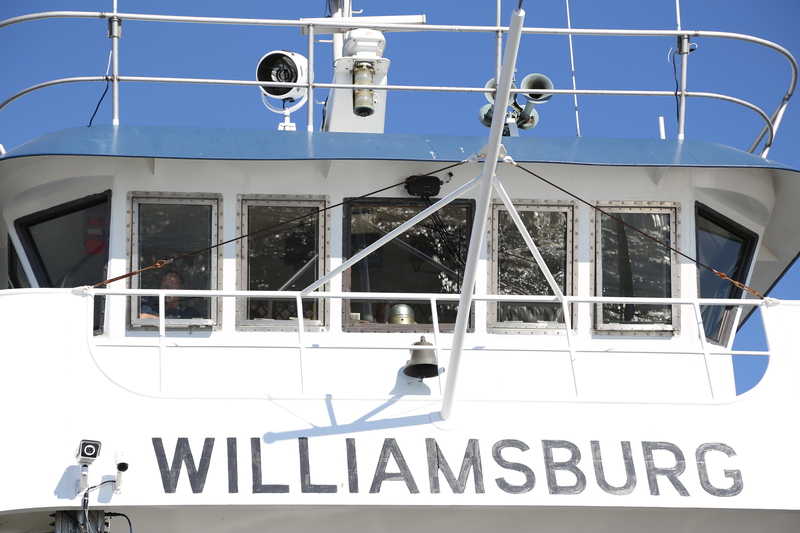 For us, it was an excuse to take the Jamestown-Scotland ferry. We were pleasantly surprised to find out that the ferry is only 2 miles from our house, you can drive your car right onto it and it is free. Yes, I said free. You would think that it would be hard to get on the ferry because of the affordable price but we did not have to wait long. The schedule has the two ferries criss-crossing back and forth several times per hour and since it is a short trip, about 15-20 minutes, you will not wait long. 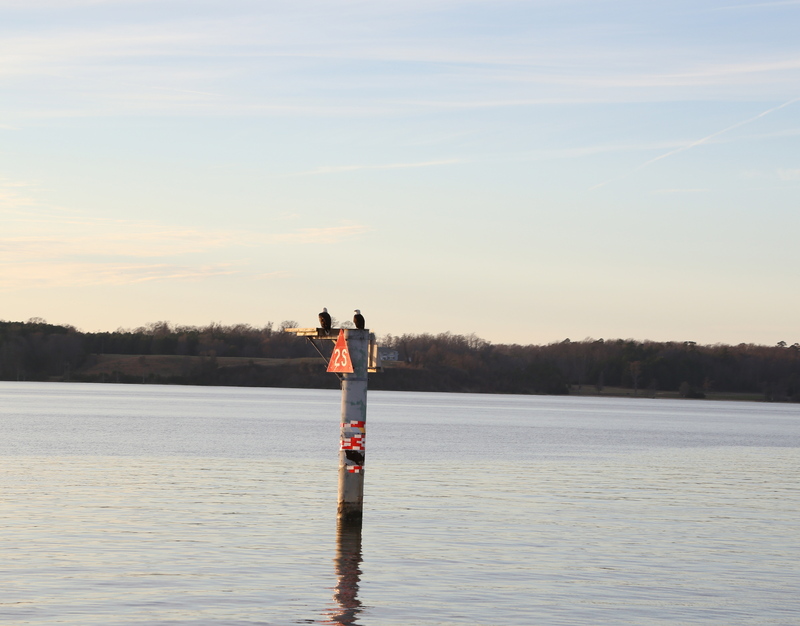 The view from the ferry is typical, shoreline, houses, trees and water birds but the one thing that sets it apart, a sweeping view of the first settlement, the true birthplace of our nation, Jamestown. 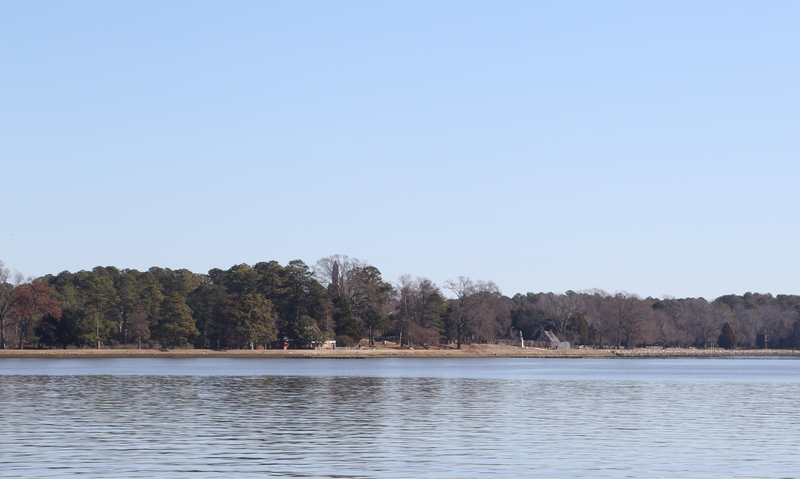 If you are new to the area, you will also be surprised by the width of the James river, it is about a mile wide here. Since it was such a sunny day, we got out of the car and took in the view from the side of the ferry. Darry and Devon had fun as I took photos. Hard to believe it was winter and we were wearing thin jackets. After a quick voyage across the river, we landed in Scotland and drove on towards Smithfield which was another 15 miles or so. 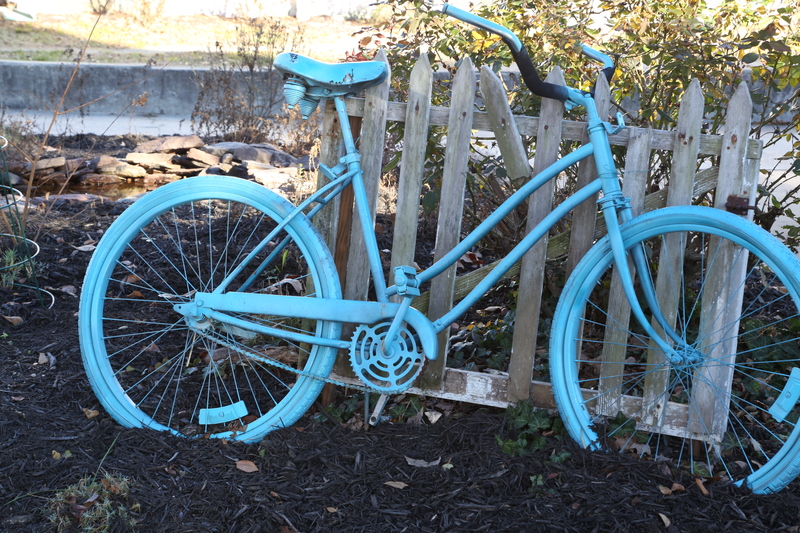 Smithfield has a thriving art community and sights like this are all over the downtown area. Look for the pig statues that have each been painted by local artists. Since it was near Christmas, many of the businesses were completely decked out and it added to the festive feel. 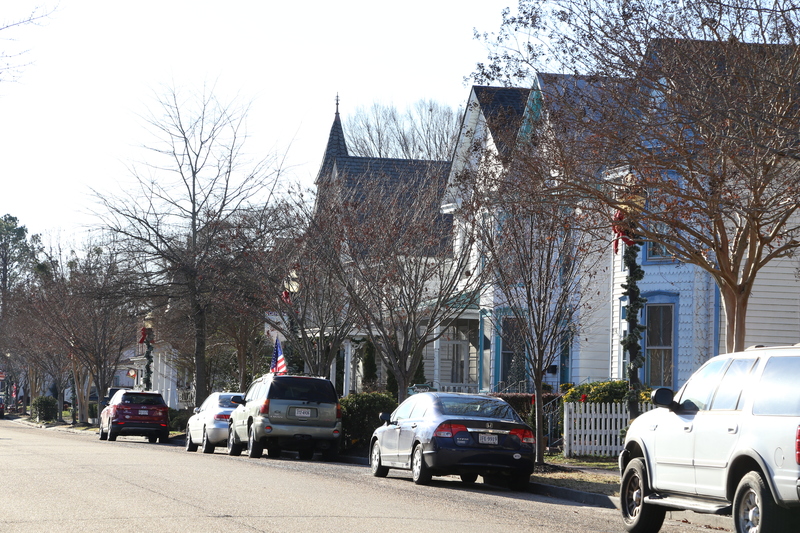 The downtown streets are lined with Victorian homes, many of which have been completely restored. We enjoyed walking and looking-it was like being back in San Francisco or Cape May, two of my favorite places to look at Victorian houses. Parking the car was easy; on the street or in a lot, it was free for a couple of hours and that was plenty of time to stroll around, visit shops and have lunch in the Smithfield Gourmet Bakery Cafe. Do not let the bakery part of the name fool you, it was a cafe and we had some great sandwiches and salads. The cafe prepares everything from scratch and that includes the breads. We went home with a loaf of their Honey Almond bread, a large fluffy sandwich bread that made wonderful toast. And then it was time to head home. We caught the ferry just as the sun began to set. Again we chose to stand out on the deck and we were lucky enough to spot a pair of Bald Eagles resting on a platform in the river. The sun set quickly as we traveled across the river towards home. 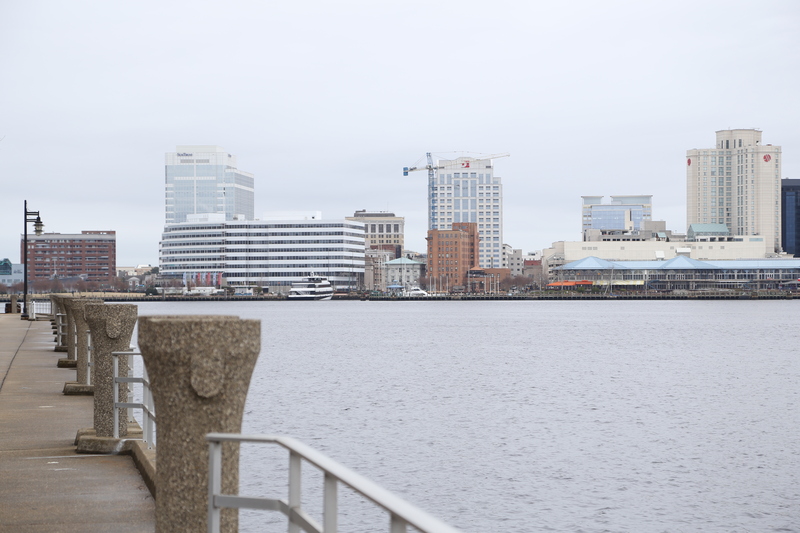 There are many points of interest between the ferry landing and the city of Smithfield and we will go to each one after the winter closures end and the weather improves. When our daughter came to visit last month, she had only a few requests: she wanted to visit a winery and she wanted to go to the beach. Fortunately, in Williamsburg, Virginia, both requests can be met quickly because there are wineries all around us and the beach is just over an hour away. 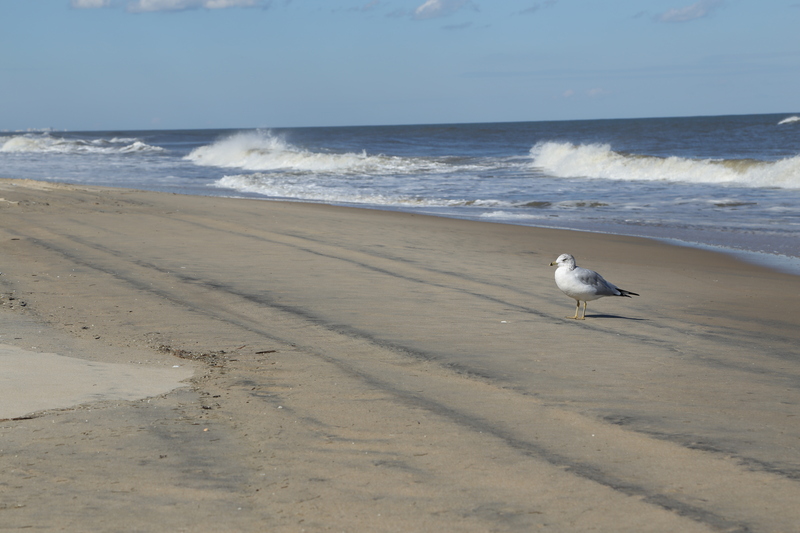 We set the GPS for Virginia beach and went on our way. After one of the best breakfasts I have had in a while (beachside no less! ), more on that another day, we walked the boardwalk and visited some shops along the way. It was a windy day and we decided we wanted to see more than the typical tourist beach stuff so we drove further down the coast to the Back Bay Wildlife Refuge. 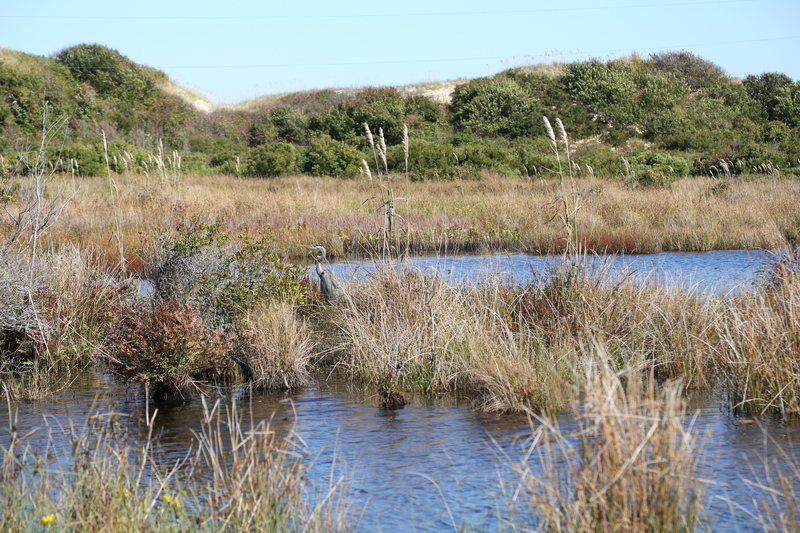 The Back Bay Wildlife Refuge, part of the National Wildlife Refuge System, is about 30 minutes from the main drag on the beach and it features multiple trails and activities. The trails lead to the bay and the beach. You can also launch boats, canoes and kayaks here as well as travel by bike. Since we were on foot, we took the Charles Kuralt trail. It was cool out but sunny and breezy and we wandered all over. 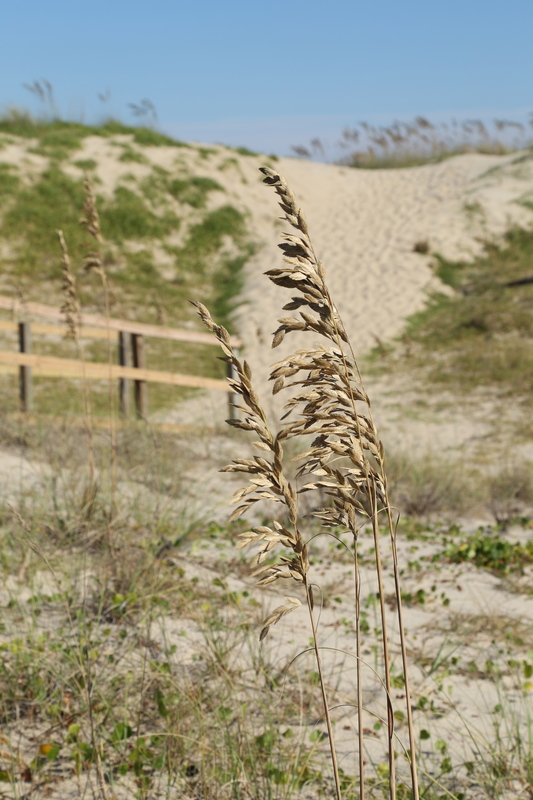 The walk from the trail to the dunes was easily negotiated along the raised boardwalk. Until you hit the base of the last dune, you can see the footprints that lead up over it to the beach and it was impossible to do without getting sand in our shoes! 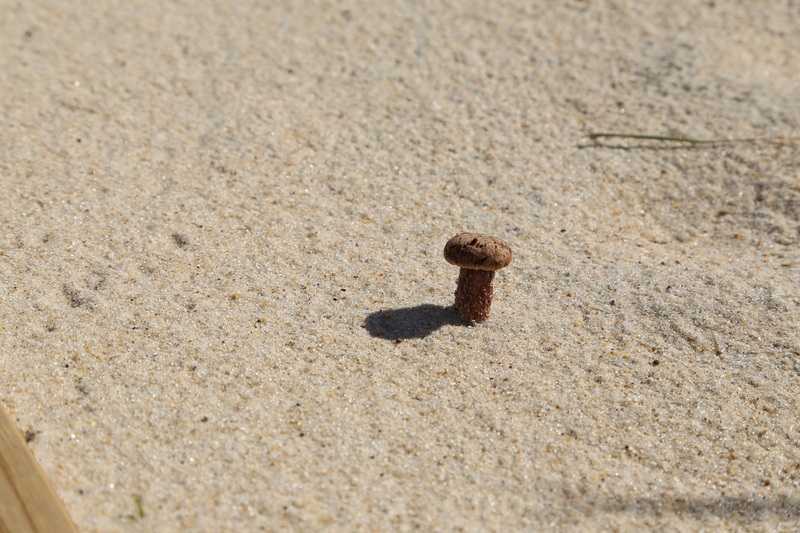 Along the way, I spied what almost looked like a champagne cork sitting on top of the sand. A closer inspection revealed that it was a mushroom. 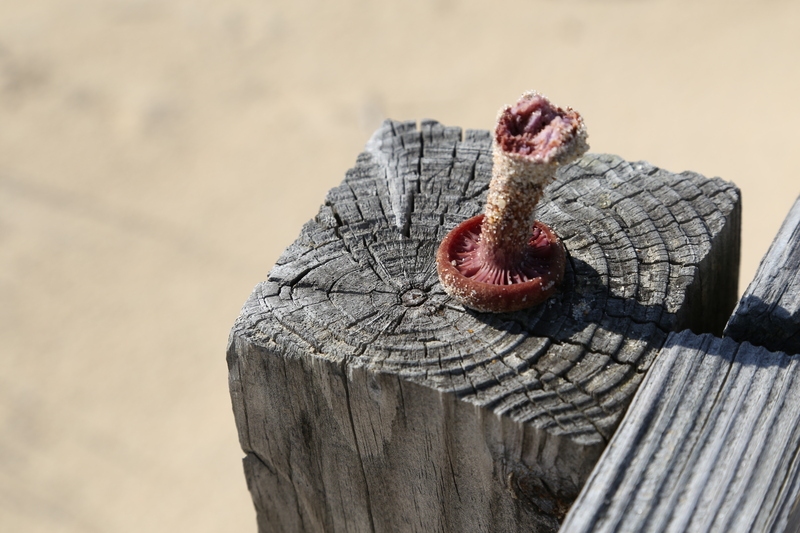 Imagine that-a mushroom growing on the sand, the mycelium was actively fruiting and we saw many of them around us. At some point, I hope to get this identified but it will be tricky, we did not bring it with us because you cannot remove things like this from a refuge. The color of the gills was a rosy red, almost a purple tint to it. If anyone has a clue as to it’s identity, please, leave a comment. 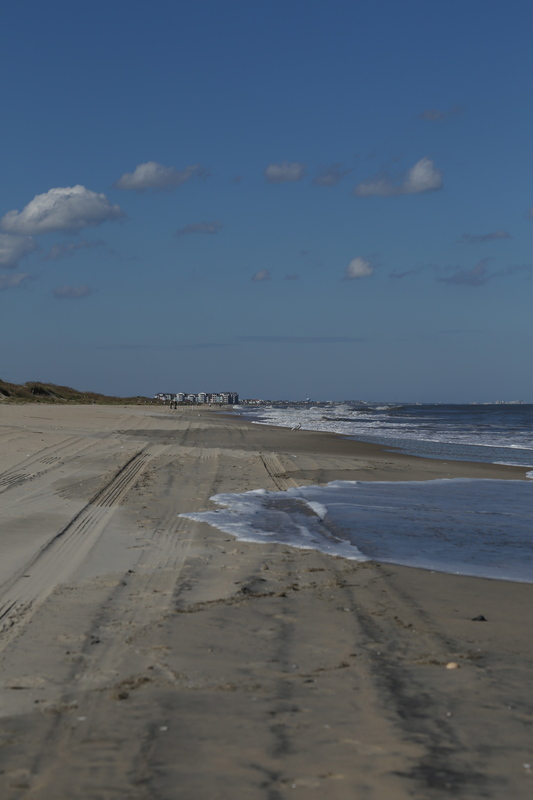 We walked to the beach and found it nearly deserted. Swimming is not allowed here but fishing is and the only other people we saw had multiple lines in water. It was a beautiful day with a deep blue sky, and the visibility was very good. Walking along the trail we passed a marsh where migrating birds will stop to hunt. Can you see the Great Blue Heron near the center of the photo? We have seen many of these birds all around the country. Although this is part of a birding trail, this guy was the only bird we were able to spot! The trails around the Visitors center are interpretive and they are also at water level. What this means is that at high tide, some areas are flooded. We couldn’t take the one trail because it was about 6″ underwater in one area and neither of us had on waterproof boots. The marsh that the path cut through was almost like a corn maze at times and we could not see anything but the plants on either side of the walkway. This wet area with its tree roots and grasses was eye-catching. 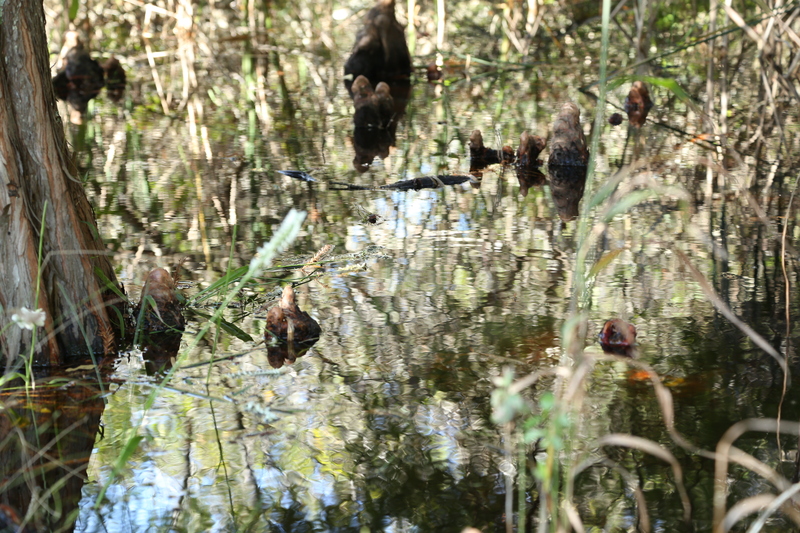 It was nearly impossible to see where the water stopped and the plants started. The only clue was the rings on the surface of the water. A shot from further away of the reflection pond. When you visit a wildlife refuge, you hope to see the wildlife. 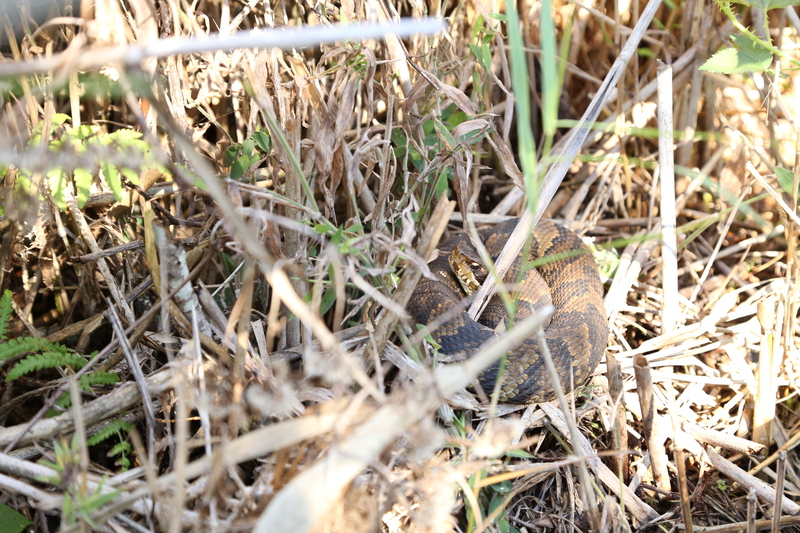 Aside from a bunch of seagulls and a heron, we only say this snake. 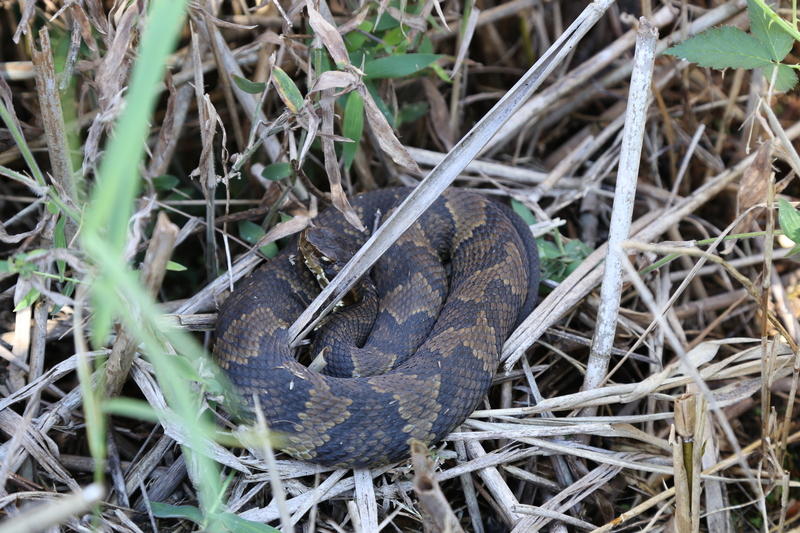 Actually, it is a cottonmouth and it is not a snake you want to mess with. Luckily for me, he wasn’t threatened by my presence and let me take his picture. You can see how well he blends in, we walked past him the first time. A teacher leading a group of students on the trail pointed him out to us in warning and we were grateful. 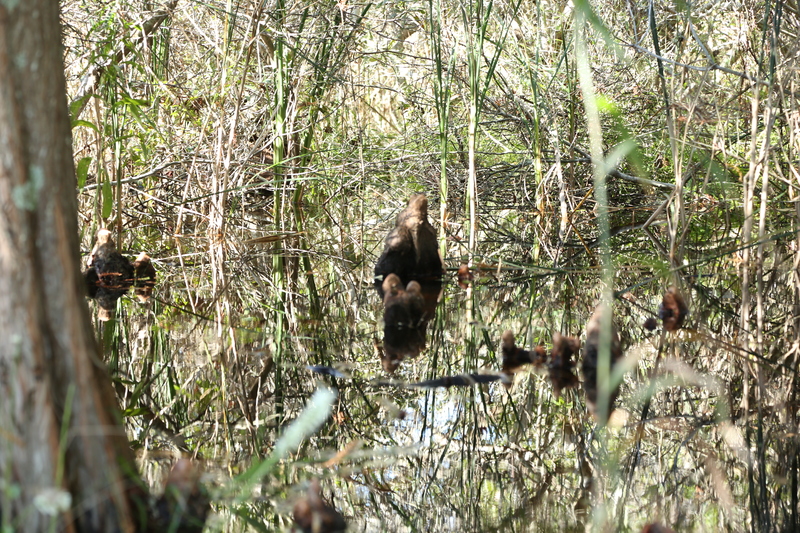 Do yourself a favor, visit the refuge and take in the sights and see what wildlife inhabits the area . There are multiple activities from bird walks to whale watches available. click on the image to visit the Friday Favorites linkup on the Virginia Bloggers website!